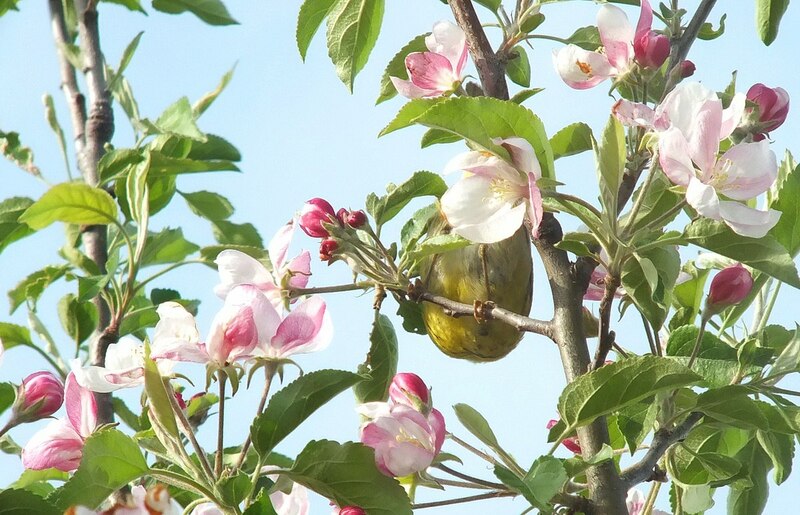 One of my favorite backyard features is the flowering crab apple tree outside our bedroom window. It reminds me fondly of the wild cherry tree that bloomed next to my bedroom window when I was a child growing up at Oxtongue Lake. 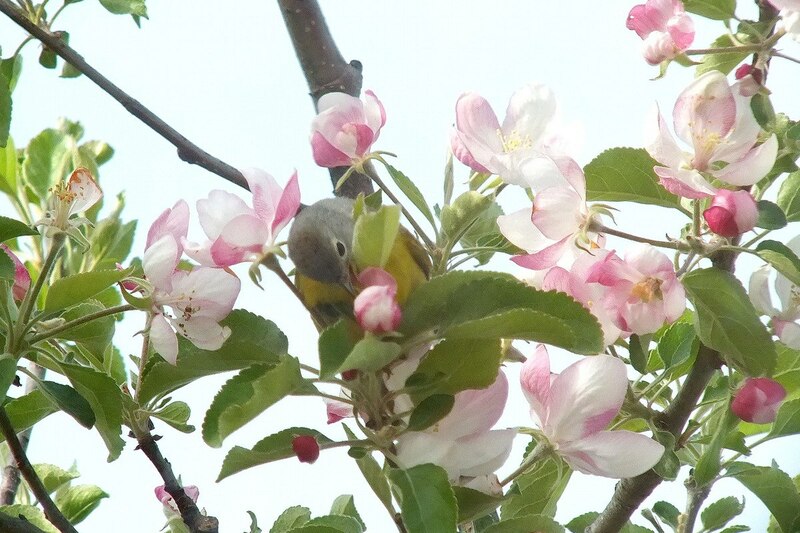 Bob and I scrutinize this apple tree for avian visitors every time we pass by the window. 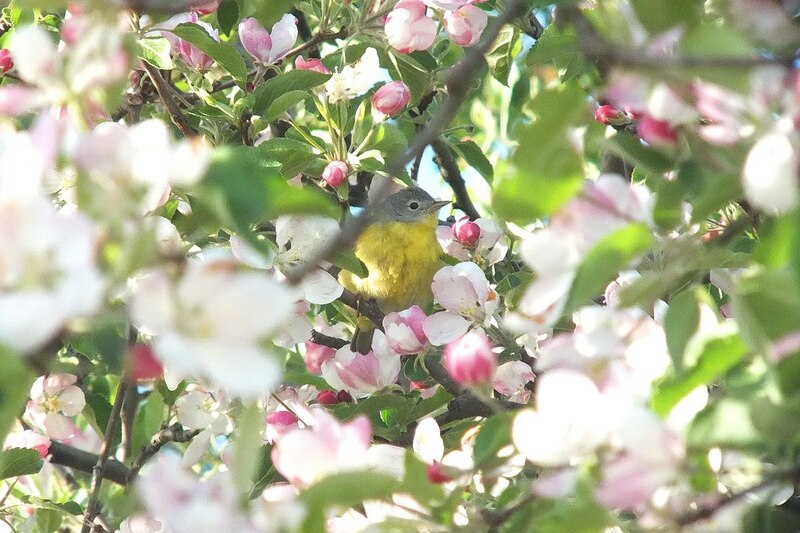 A pleasant surprise greeted us late one afternoon when a Nashville Warbler (Oreothlypis ruficapilla) sat nestled in amongst the pink flower buds. 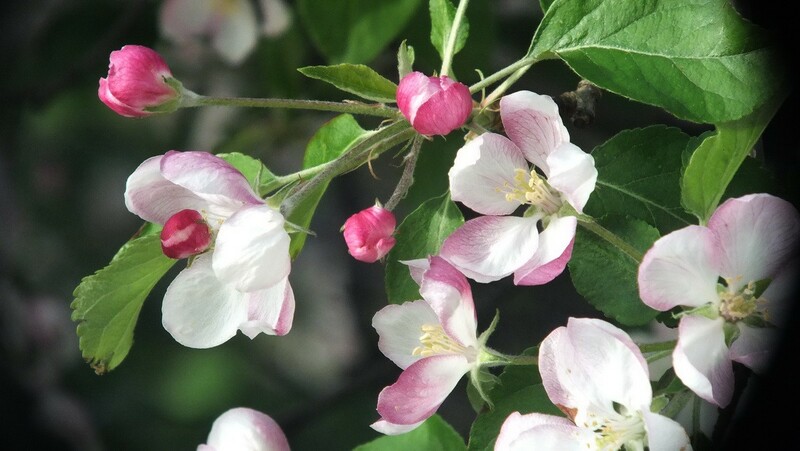 I love the delicate pink blooms of my flowering crab apple tree. It was a housewarming gift from my sister, Colleen, some 30-odd years ago, and has provided yearly pleasure with its colourful blooms. 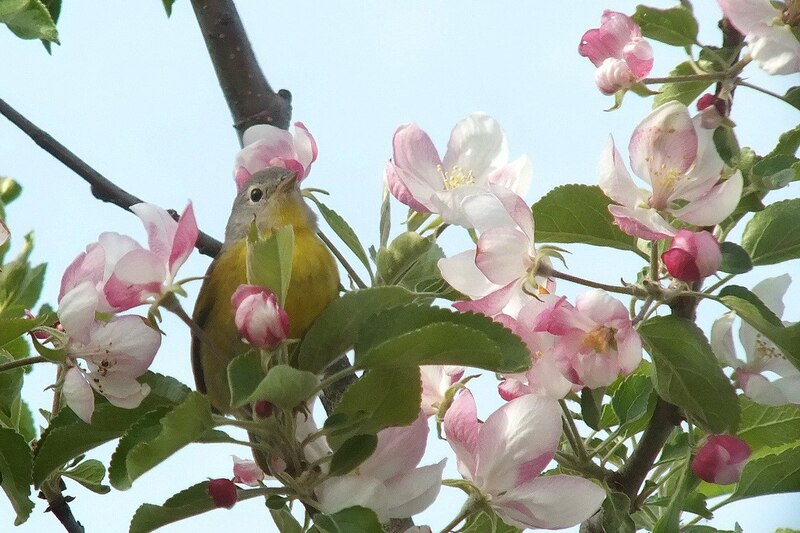 With sun glinting through the yellowy-green leaves of the tree, the warbler at times seemed to disappear before our eyes, but then an uncharacteristic jiggle of another twig would alert us to the bird’s new position. The tiny warbler kept us occupied for hours at a time, observing its behaviour and trying to capture photographs. 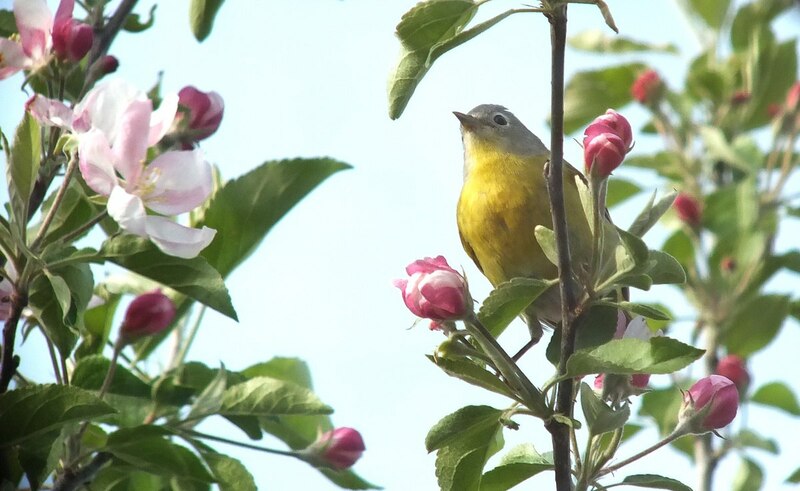 Nashville Warblers are so-called because the first one was discovered in Nashville, Tennessee. Nashville Warblers mainly consume insects, so I was unsure as to whether this one was actually nipping off the sweet flower buds in addition to snatching up some little bugs. 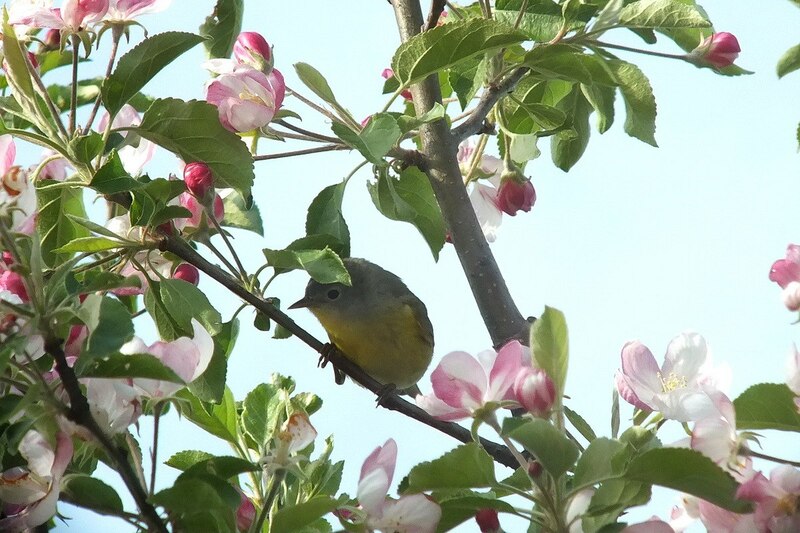 The sun was streaming in through the apple tree branches as the warbler went about its business, undeterred by lawn mowers whirring in the neighbourhood or our own faces pushing up against the streaked glass of our window. 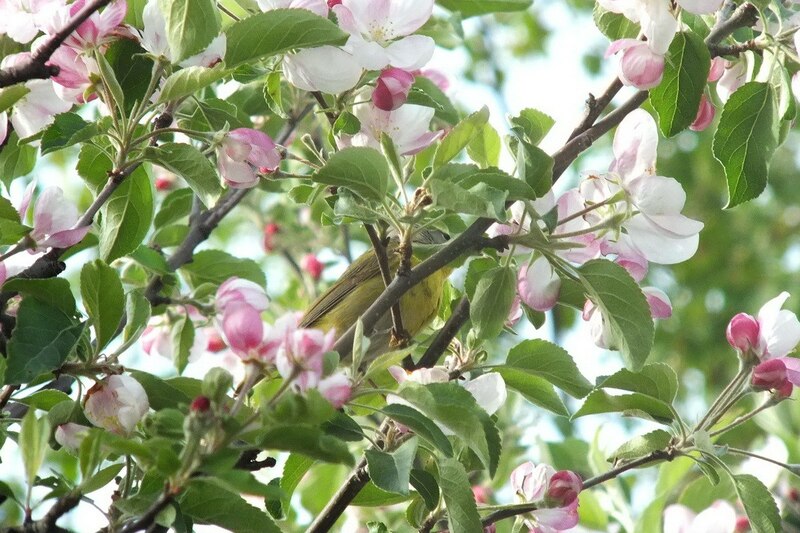 I was so pleased to get a clear shot for positive identification because so many warblers resemble one another. The bluish-grey plumage on the head, cheeks and sides of the neck, combined with the white eye ring, helped establish this as a Nashville Warbler. But it is the bright yellow throat and breast in contrast to the olive-grey back and wings that make this little warbler a real standout. 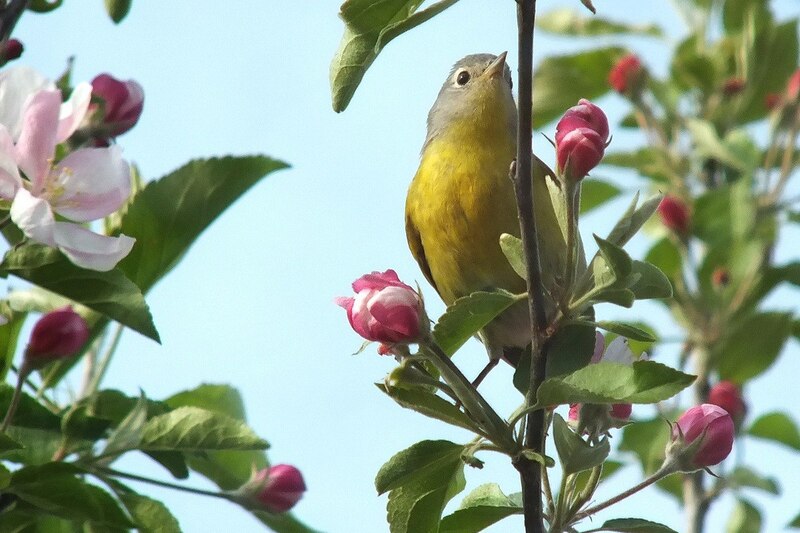 We were lucky to have the Nashville Warbler visit our backyard garden over the course of several days.